NETWORK FINALS: The scheduled new episode of BORDERTOWN didn’t air due to the east coast NASCAR overrun. 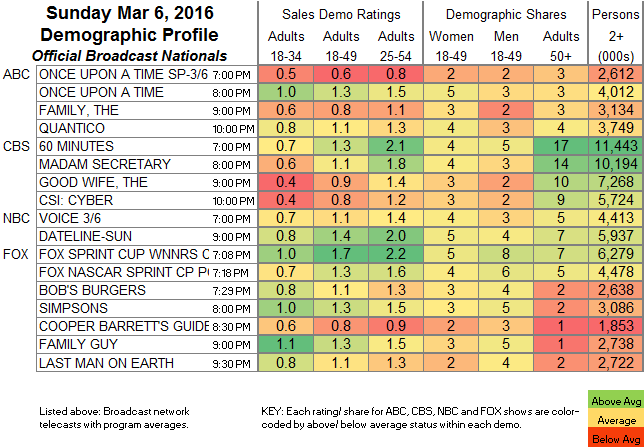 In the same hour, the ONCE UPON A TIME rerun lost 0.1 in final numbers. At 8PM, MADAM SECRETARY declined 0.1. CABLE HIGHLIGHTS: (NOTE: due to last week’s Oscar-related preemptions, comparisons except where noted are to the episodes that aired 2 weeks ago.) Now that the broadcast networks are done with Sunday football and winter special events, AMC’s THE WALKING DEAD is the unquestioned champion of all TV, up 0.07 from last week to 6.15 (with a particularly violent episode even by its standards). TALKING DEAD followed, up 0.09 to 2.32, and COMIC BOOK MEN was up 0.03 to 0.39. CNN’s (slightly) less bloodthirsty coverage of the Michigan DEMOCRATIC DEBATE was at 1.35. Bravo’s REAL HOUSEWIVES pair had ATLANTA down 0.15 to 1.25, and POTOMAC up 0.02 to 0.71. On Showtime, SHAMELESS returned from its Oscar break down a tenth to 0.62, BILLIONS was down 0.02 to 0.36, and THE CIRCUS fell 0.02 to 0.05/192K. Adult Swim’s VENTURE BROTHERS was down 0.03 from last week to 0.50. A Discovery NAKED & AFRAID special was at 0.45. On History, AX MEN edged up 0.02 from last week to 0.45. TBS’s SEPARATION ANXIETY hasn’t officially premiered yet, but a “sneak peek” was promising at 0.45. Spike’s BAR RESCUE was at 0.44. On Food Network, ALL-STAR ACADEMY ticked down from last week to 0.41, CUTTHROAT KITCHEN rose 0.07 to 0.37, and GUY’S GROCERY GAMES was steady at 0.36. Things didn’t improve at HBO, where LAST WEEK TONIGHT continued to be the ratings highlight, up 0.07 from last week to 0.33. Beyond that, GIRLS was actually down from last week’s telecast against the Oscars by 0.02 to 0.24, VINYL ticked up to 0.21, and TOGETHERNESS fell 0.04 to 0.11. The season premiere of E!’s I AM CAIT was a 0.32 pebble compared to the boulder of last year’s 1.15 series premiere, while HOLLYWOOD MEDIUM tumbled by 0.13 to 0.28. A&E’s HOARDERS gained 0.06 to 0.31. Even though MYTHBUSTERS aired its putative finale on Saturday, a fresh episode aired on Science at 0.31. 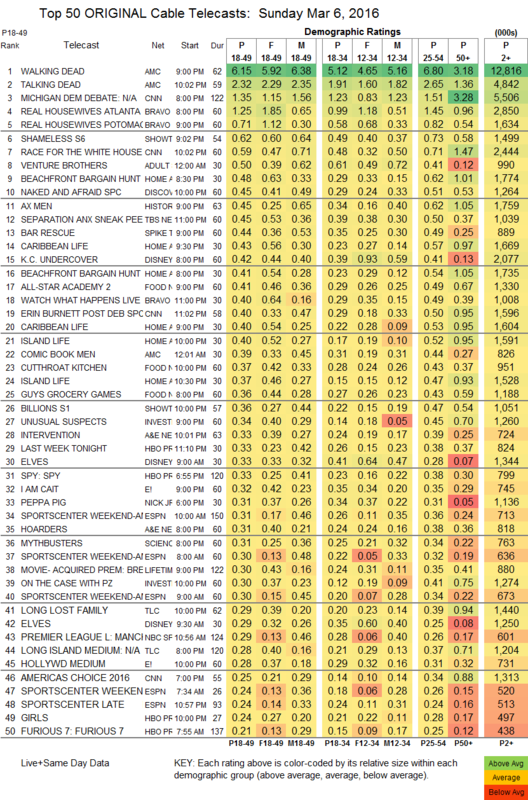 On TLC, LONG LOST FAMILY was at 0.29, and LONG ISLAND MEDIUM fell 0.11 to 0.28. Hallmark’s WHEN CALLS THE HEART dropped 0.03 to 0.20.